Since their introduction into the UK in the late 1980's those involved with the breed have been conscientious in protecting its integrity, health and well being. 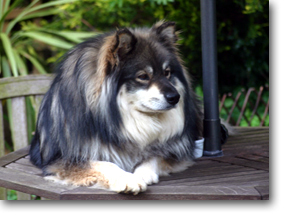 Careful breeding has ensured that the Finnish Lapphund is one of the healthiest breeds. In general terms, the Finnish Lapphund is a very robust and healthy breed with an expected life-span of 10-15 years. Below is some information about health issues that particularly relate to Finnish Lapphunds. Although these conditions are known to occur in the breed, they are not common. If you have questions about other dog health problems, you should always ask your vet. Some breeds (esp. collies) are known to display a sensitivity to a family of anti-parasitic drugs known as ivermectin and it appears that a similar reaction is seen in Finnish Lapphunds. Before worming your dogs it is worth mentioning this fact to your vet and to read the information available and familiarise yourself with the drugs involved, it is possible to avoid this family of wormers altogether. This is an inherited eye defect where the retina degenerates over time. Reputable breeders test their animals regularly to reduce the chances of passing on the condition. It usually only becomes apparent in mature dogs of over 5. An American research company called Optigen have identified the gene responsible as the prcd-PRA (progressive rod cone degeneration) already known in several other breeds. If you are interested in getting your dog tested for this condition, there are clinics available, ask us for details on how you can participate. For those who are considering or waiting for an FL puppy, you should talk to your breeder who will know the status of the parents and can make you aware of the risk in advance. A condition common amongst many breeds, where the ball and socket joint of the hip is not properly formed, leading to pain and difficulty walking. The Kennel Club/BVA operate a scheme whereby dogs are x-rayed and scored for the degree of dysplasia of the joint, the lower the score the better. The breed average for each breed of dog will vary, and at the time of writing the breed average for the FL is 12. The Kennel Club advises breeding from dogs with lower than the breed average. However it should be noted that HD is not a simple inherited condition, other factors such as feeding, exercise and unknown damage may play a part in the development of the condition. Another problem common among many breeds, cataracts affect the opacity of the eye’s lens. Dogs are subject to many forms of cataract, some of which are hereditary. Cataract appears as a whiteness or greyness of the lens, visible through the pupil, making it look cloudy. It appears that the hereditary cataract, which is seen in the FL, occurs after the dog is one year of age, and is not believed to be progressive. The way the condition is inherited is not proven, but reputable breeders will have their breeding stock checked regularly.